Anyone have an example of a refinery complex approaching cleanliness? Mine is a hideous slapdash affair (due mainly to figuring out systems on the go) and I'd like it to be neater next time I build one. This is my refinery setup. It's a bit cramped, but is probably the most efficient way to hook a bunch of refineries up to the same system while also being easy to set up chemical plants off of any of the outputs. 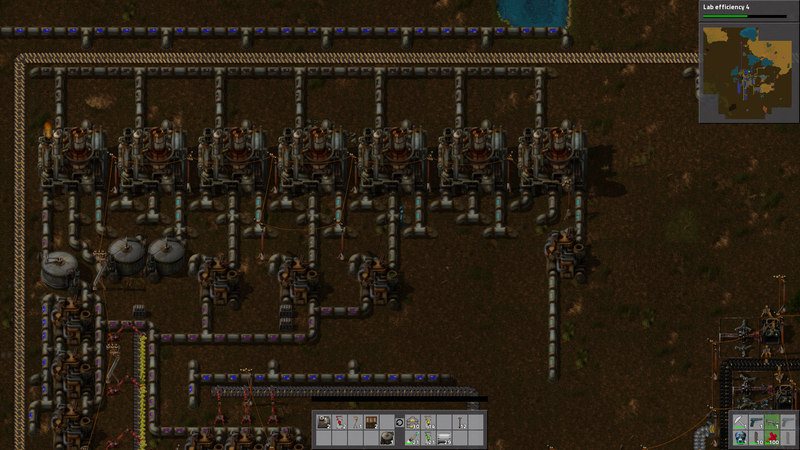 I don't have any screenshots handy, but my basic refinery setup takes advantage of the way a pair of adjacent refineries' outputs are offset by exactly five squares, which is just perfect for connecting to a pair of storage tanks. Then I can expand that setup in any direction. The real secret to a non-suicidal refinery setup is to use below-ground pipes wherever possible, but most of you seem to have that under control. One thing I would like to see is the ability to disassemble items. Not necessarily getting all the parts back, but maybe half of them. Is there anyway to delete items from your inventory? 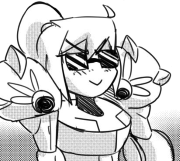 I am up to using electric furnaces in my current game, and I still have burner drills and stone furnaces in my inventory. Stuff them in a chest and forget about them. If you stuff them in a chest and then destroy the chest the items will disappear. Is there an actual reason to use solar? I don't mind building big arrays, but transitioning to it from steam seems pretty hard, given that you don't get power at night. 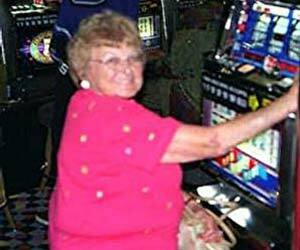 I feel like I would need much more powerful accumulators to make the transition without going crazy. Steam is just so easy and reliable. Probably the only reason is less pollution. You could also be running out of coal (hahaha) but I usually have more solid fuel than I know what to do with once I start oil refining, so it would be easier just to use that to fuel your boilers. I don't really know how I would run out of coal. I've moved over to electric furnaces. Right now the only thing I use it for is fueling my boilers, and they honestly don't take that much. Do biters only attack things that generate pollution? Can I put a huge solar/accumular array off to the side, and know that I don't have to defend its giant borders? Batman touched my junk liberally. 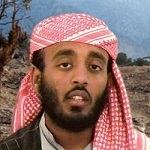 Biters are attracted to things that pollute and target them to start, but will change their target to Distractors, Constructors, Other Drones/Player, Turrets, and Everything Else in that order if they see them. Once one of them is attacking their chosen target, the rest will randomly target nearby things (if they aren't being actively shot at, that is). They will run past things that aren't their primary target (ie, your solar fields) unless they are blocked, in which case they attack the block (which might be your solar field). Going solar reduces pollution A LOT, and means that you can get into needing purple science without ever even seeing a Big Biter. My second/current game I went spawner hunting and was able to kill the nest, only having to kill two medium biters (and a slew of smalls). 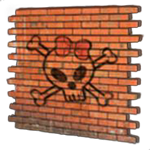 I have small pillboxes (4 turrets, a space, double walls) on my major attack routes that easily clean everything off. Pillboxes are circled. The accumulators are completely unguarded and have been left alone, the solars only get attacked I think because they block the way to the meat of my base. 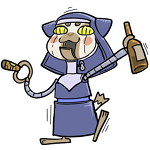 Biters generally go for things that cause pollution first, but they do have a set of higher priority targets if they can get them (like your logistics bots), and they will munch on anything that's blocking their path (walls, pipes, belts, etc). So while they'll happily ignore your power poles, they are likely to get stuck somewhere in your giant solar array and start taking chunks out of it. You don't actually "need" solar, really, once you start processing oil. You can easily convert heavy oil, which is otherwise fairly useless, into solid fuel and pretty much never worry about boilers running out of stuff to burn. I really hope he adds stuff like fission power and fusion power. Both of which would require a boatload of resources and materials and need you to manage the thermal output of them via water cooling to avoid them exploding. Managed to get myself to solar only. Spudnewt was right about efficiency modules. Makes a big difference in how much juice you use and how much pollution you produce. I would suggest picking those up pretty early, especially if you want to keep your pollution down, or plan to go solar. One thing I am learning is that you don't really want to overbuild from the start. If you can keep two labs going all the time, you are in fine shape, especially once you get to blue science. It is easy to start laying down the plans for a giant production empire, trying to feed six labs, taking forever until you actually finish your chains, and producing mega-pollution in the meantime. A small finished loop right now is better than a huge unfinished loop. Here is what I have meeting my modest power needs at the moment. I built it by the coast, so that biters are unlikely to walk by. Not that I am even generating enough pollution to get attacked. 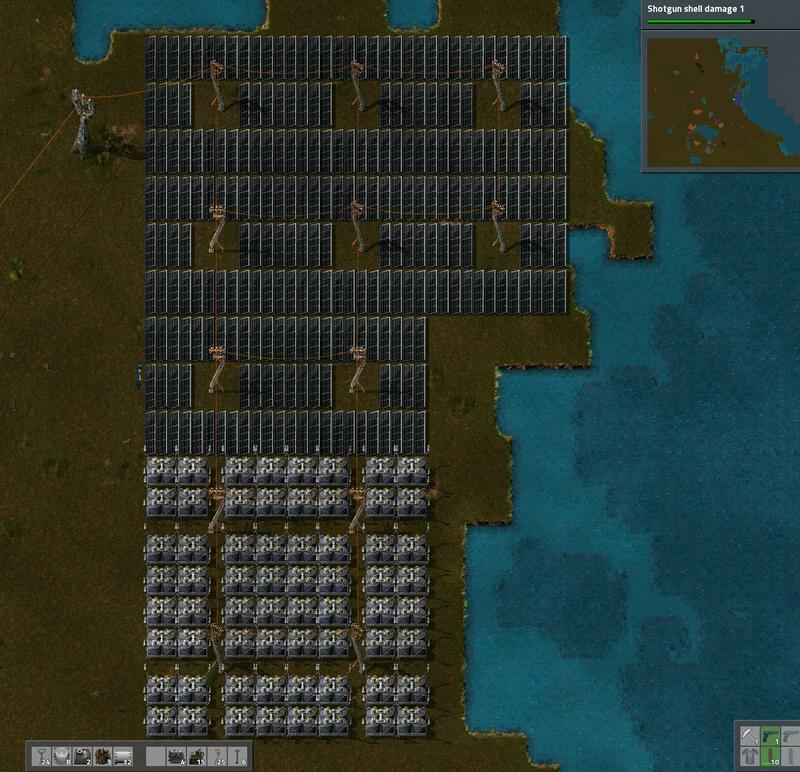 I usually use solars during the day backed by smaller modular steam engines. usually I'll have 2 water pumps feeding 10 boilers feeding 16 engines. A few of these scattered around my complex is enough to provide solid power in just about any circumstance. Not too mention they are juuust small enough to not attract too much biter attention. Plus, I usually power remote mining complexes with solar only and power saving modules to minimize any actual need for defense. Hell, after you get big power lines it's even possible to build a global power network using big towers for long distance transmission. At that point you can just bury your power plants in the safest spots you got beam it wherever. Had a big worm protecting about five biter spawns in my sandbox game. They were becoming an issue because my pollution was triggering them about every five minutes. I could walk turrets in to clear three of the spawns but the last two were just underneath the worm. I couldn't keep empty turrets up before they were nearly dead by the swarm and the homing shot. I figured I'd try some advice in this thread: take a car, load up a flamethrower, roll down the window and burn the place to the ground. In a short five seconds I burned the swarm then accidentally rammed the worm, killing it and the car. I'm really liking the 'central bus' setup someone posted earlier in the thread. Just got blue science running! It is a good method for keeping things organized. I am rebuilding using that right now. Tore down my old base, where I started off doing a lot of stuff by hand, and am going from the ground-up using better tech. Just got to green science again. Have my solar array and accumulators off by the ocean, keeping things up. Still not generating enough pollution to actually get attacked. I have efficiency modules in most of the places they can go now. Just need to put them in a couple more electric miners, and the science labs. Aaag, why is the power monitor so hard to read? I can never tell when I'm overcapacity or falling short. Clicking on a power pole will give you a much better picture of your power production/use. Essentially you only have to read the top two bars and compare them. Is your production larger than your consumption? You're good! If it's not then you need to add more energy production or add efficiency modules. Always a good idea to have your power production higher then your theoretical maximum. Speaking from experience, if you deplete a portion of your line and suddenly ALL your inserters and AND your factories/smelter are running at full capacity to catch up, it can create a serious issue where your steam generator plants are suddenly using more fuel/water then than you thought possible when it was running at half cap. I'm a freakin' blur here! Does anyone have the math on how many of each component you should be building for Red/Green/Blue production? 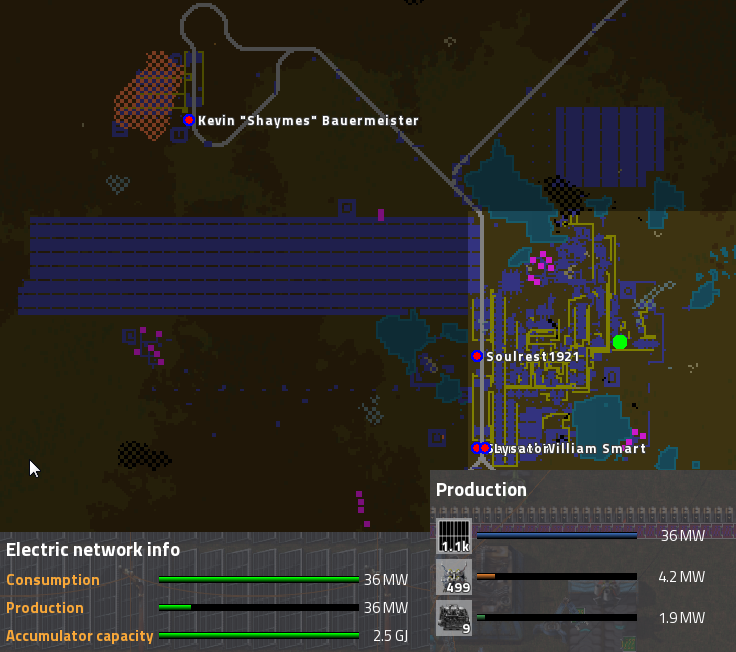 Like, optimally, how many factories should I have spitting out copper cable if I want to keep a red factory and a green factory working full-time? A spreadsheet or something would be handy. It isn't an even number once you get past red science. 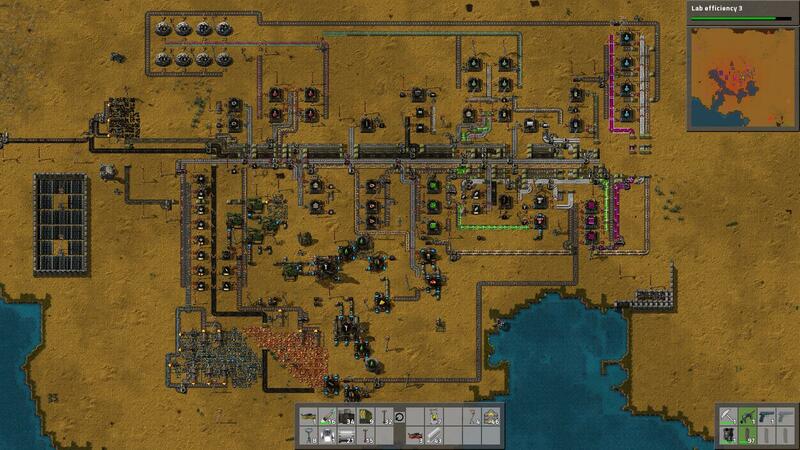 It is mostly inserters that screw it up, given that you need 2 for every 3 green beaker factories. It leads to lots of fractions of factories. 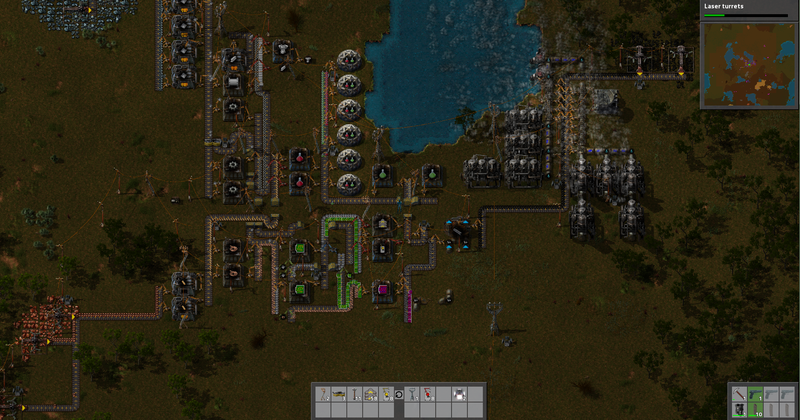 Here is a birdeye overview of my base now, with red, green, and blue beaker production. Shows my laser defenses too, not that I have been attacked. 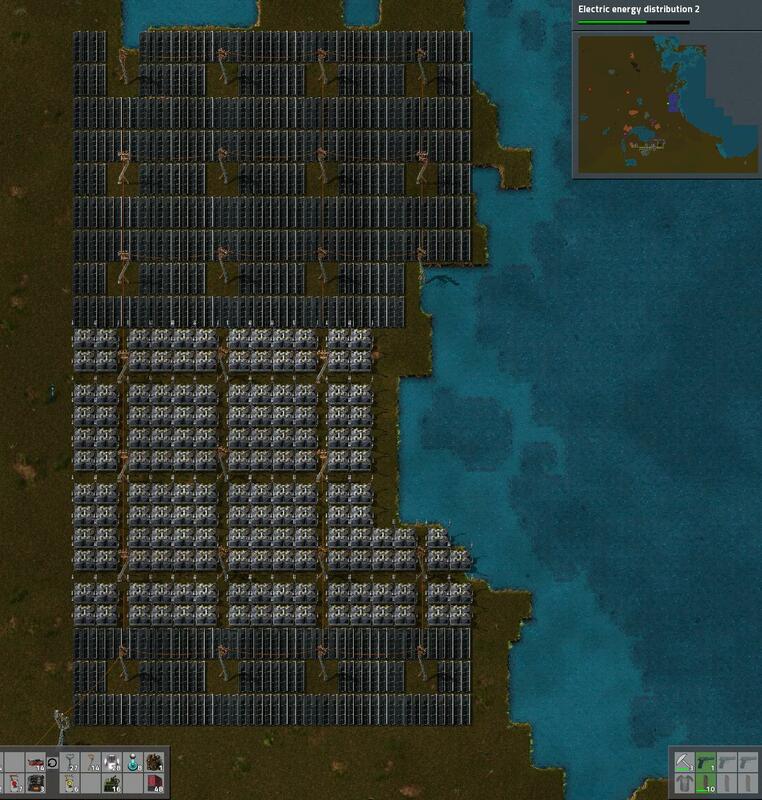 Operating purely on solar power, and everything has efficency modules. Every time i get a significant upgrade, i feel the need to completely overhaul my whole system. 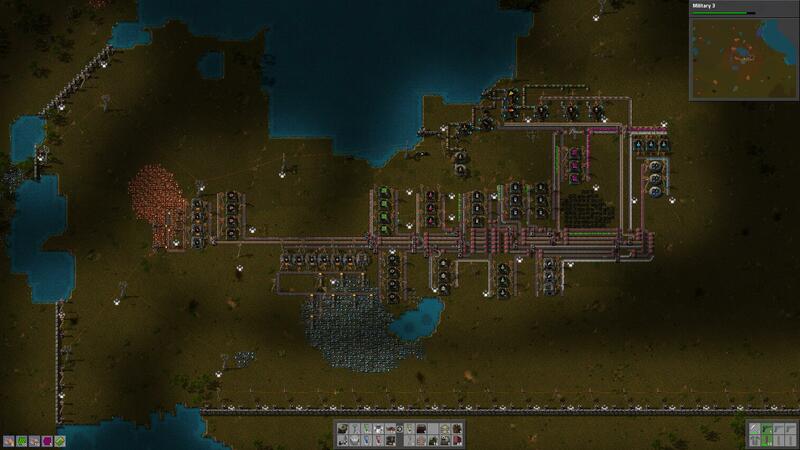 I did it when i got upgraded power poles and just spent 3 hours rebuilding from scratch after electric furnaces. I love how you can have nearly infinite throughput. I have a green factory with three blue inserters taking copper in and three blue inserters taking it out, just making GBS threads out wire as fast as possible. I have two regular wire factories feeding circuit board factories, copied four times, all feeding the same hungry line, going towards inserters (green/blue sci) and advanced Circs (blue sci/processors), and still the line hungers for more, but I'm out of real estate. The green wire factory above isn't making basic circuits. Just finished updating my coastal solar field. 795 MJ of accumulator capacity now. Could probably survive two nights in a row without any sunlight now. My thought via furnaces is just to hand-feed them coal before you get electric. It takes a while for a furnace to go through a stack of coal, and belting it is time I will just have to spend undoing later. Just prioritize getting electric furnaces. Yeah, electronic circuits are my short line right now, that are holding some others up. I have five factories dedicated to it, and probably need at least another three. Turns out when you swap green modules for blue modules in your furnaces and assemblers, your power needs bump up a little bit! 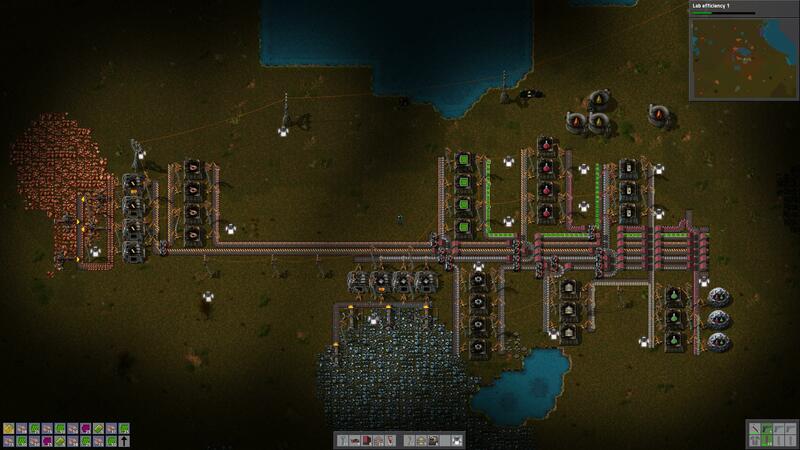 I'm trying to figure out logistics bus-belts - my basic core right now is wire, copper, iron plates, steel beams. To get blue science, I need a lot more than that - and I'd guess I don't want a logistics belt of fast inserters going down my core. What's a solid blue-science production line even look like? 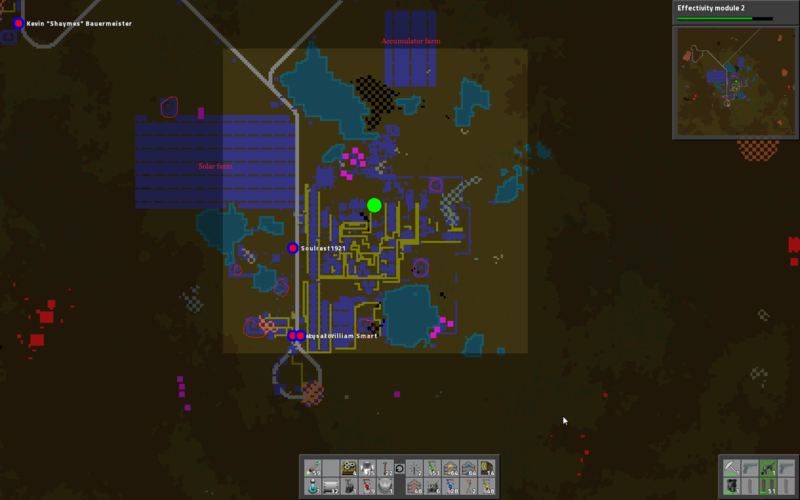 The bus-belt line I posted here makes blue science. The one change I would make is probably an extra copper mine/smelter, an two extra copper wire factories, and two extra circuit factories. I don't add some secondary products to main belt, if I know I won't use them anywhere else. I wouldn't try to feed more than two or three labs to start. You can expand later, if you feel the need. I wouldn't necessarily prescribe bus-belts for secondary products, especially not the blue inserter chain for blue science. My setup uses direct feed from blue inserters to green (robot arm pulls from blue and stuffs into green) and then drone-flies the green inserters to the blue science plant. My setup has been good up to now, but mass-producing those circuit units may just be a bridge too far. Next game I'll make sure my refinery complex is near my factory complex, and I can just train barrels from the oil field to the factory. Are there any missions after this dumb get the computer from the cashed ship mission(new hope 3 I think)? Yes, you get to gently caress around with oil in the next one. I think this is a pretty good factory for only my second free world. Now I just need to hammer out the supply chain for blue beakers, then relocate my labs.